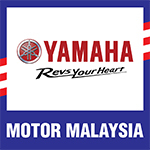 Yamaha Motor Co., Ltd. (YMC) will join with its Malaysian distributor Hong Leong Yamaha Motor*1 to hold the 4th YAMAHA ASEAN CUP U-13 FOOTBALL Malaysia 2012 international youth football tournament with the cooperation of the Football Association of Malaysia. The tournament will be held over the three days from July 13 to 15, 2012 at the Stadium PJ Kelana Jaya in the state of Selangor,Malaysia. There will be six teams from Malaysia (two teams), India, Indonesia, Vietnam and Thailand that have won qualifying matches to represent their respective countries fielding players under 13 years of age. The teams will be divided into two groups for round-robin competition and the two teams with the highest point totals in each group (total of four teams) will proceed to the final tournament. As a company with a corporate mission of Creating Kando*2, Yamaha Motor carries out activities to popularize, promote, and support sports ranging from motor and marine sports to rugby and football, both at home and abroad. These activities are a direct reflection of the “Spirit of Challenge” that we value so highly in our corporate culture as well as our commitment to youth development and social contribution. In the important ASEAN market with its Yamaha production bases, Yamaha Motor, in cooperation with our group companies in the region, organizes two YAMAHA ASEAN CUP competitions as symbols of group’s activities in the region and as a means to strengthen the Yamaha image as a sporty brand. 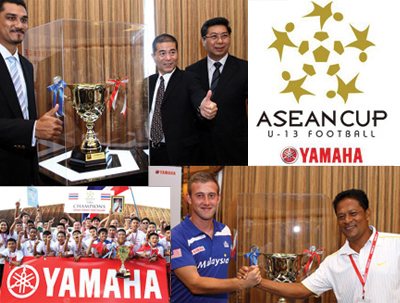 One of these is the YAMAHA ASEAN CUP RACE launched in 2003 as a one-make motorcycle competition, while the other is the YAMAHA ASEAN CUP U-13 FOOTBALL tournament for selected teams Under-13 football players launched in 2008. The aim of both of these events is to bring together players and teams from each country and provide them with an opportunity to improve their competitive skills and build international friendships in a healthy atmosphere that contributes to youth development through sport and the promotion and spread of sports. This year’s YAMAHA ASEAN CUP U-13 FOOTBALL Malaysia 2012 tournament will be run by the 1 Malaysia Cardiff City (1MCC) organization. 1MCC also runs the “Liga 1MCC Hong Leong Yamaha,” a youth football league competition and tournaments in three age groups (Under-12, Under-14 and Under-16), and Hong Leong Yamaha is the title sponsor of this League. The Yamaha Motor group’s efforts to support aspiring young footballers in the ASEAN region is not a temporary promotion but an ongoing program that has continued to expand steadily and become established in each country through cooperation with the local football associations since the holding of the inaugural YAMAHA ASEAN CUP U-13 FOOTBALL tournament in 2008. Yamaha Motor’s corporate principle is to “offer new Kando* and a more fulfilling life to people all over the world” through our product creation and services while also striving to contribute to the further development of society with the human resources and corporate assets nurtured through our main business. Yamaha Motor Co., Ltd. has two teams competing at the top level of professional sport in Japan, Jubilo Iwata in Japan’s football J. League and Yamaha Motor Jubilo competing in the rugby Top League. At the same time Yamaha Motor has supported youth development through a variety of sports at the junior level, including support for school programs and organizing tournaments and other sporting events, all with the aim of helping nurture creative, healthy youth. In addition to these corporate efforts, Yamaha employees also use their unique skills on an individual volunteer basis to contribute to society in a variety of ways. In November of 2005, as part of Yamaha Motor’s 50th anniversary commemoration, the company sought to expand its programs by establishing the Yamaha Motor Foundation for Sports. Its aim is to contribute to society through the promotion and elevation of sport culture. For the Yamaha Motor group, the ASEAN region is extremely important not only as a market but also as the home of some of the largest Yamaha production bases. In Yamaha Motor’s main product line, motorcycles, Indonesia, Thailand and Vietnam account for over 80% of total unit sales today. In these important markets, Yamaha Motor is concentrating not only on introducing attractive, environment-friendly models to heighten the competitiveness and profitability of the product line up but also applying corporate assets aggressively to increase production capacity and train the next generation of technicians capable of increasing product quality. Furthermore, the Yamaha Motor group is actively pursuing programs in areas including environmental preservation, safety promotion and support of youth development activities to fulfill its responsibilities to the regional societies as good corporate citizens. Since the 1980s, the Yamaha Motor group has been promoting motor sports and other sport and culture programs in the ASEAN region. Recently, Malaysian group company Hong Leong Yamaha Motor Sdn. Bhd. has been working closely with 1 Malaysia Cardiff City (1MCC), an organization that aims to help young athletes interested in football achieve their potential and encourage exchange among young footballers. In Thailand, group company Thai Yamaha Motor Co., Ltd. is the official sponsor of the Muang Thong United Football Club, which has recently conducted talks with Yamaha Motor’s Jubilo Iwata team in Japan with the prospect of future exchanges between players. Meanwhile, Yamaha Motor Vietnam Co., Ltd. has been supporting the Under-11 and Under-13 Vietnam national football tournaments since 2008, the Vietnam Student Football tournament from this year and has launched a “For the future of Vietnamese Football” program to provide strong support for youth football. In Indonesia, group company PT. Yamaha Yamaha Motor’s pro football team Jubilo Iwata competes in J. League. This photo is of defender Yuichi Komano who was chosen to play on Japan’s national team for the World Cup preliminary matches. Scene from the Under-12 category of the 2012 “Liga 1MCC-Hong Leong Yamaha” football tournament. C Jubilo 3 Indonesia Motor Manufacturing organizes youth football clinics with the cooperation of the Football Association of Indonesia aimed at raising the level of youth football skills. Also, India Yamaha Motor Pvt. Ltd. has worked in cooperation with the Indian Football Association to organize the qualifying tournament for participation in the YAMAHA ASEAN CUP U-13 FOOTBALL tournament. In these ways, group companies throughout the region are promoting youth sport. Yamaha Motor started the YAMAHA ASEAN CUP U-13 FOOTBALL tournament in 2008 in hopes that it will become a symbol of our efforts to contribute to youth development through sport in the ASEAN region while helping to develop football skills of the players and teams by providing an opportunity for them to compete with teams from other countries. Yamaha Motor`s aim is to make this tournament one that will feed the dreams and ambitions of young players who wish to someday compete in competitions like the World Cup and the Olympics. Another important aim of this event is to make the entire stadium a place where not only the spectators but everyone involved can share the excitement and deep satisfaction that Yamaha calls Kando. when we encounter something of exceptional value.